Reprinted from the March / April 2014 issue of Christian Woman Magazine. My daughter loves Hello Kitty, so much so that she requested a Hello Kitty cake for her birthday – her 19th birthday. I set off to the local Publix to find the exact cake she had described. I not only found the cake, but I also found a life-size Hello Kitty balloon, complete with streamers. So, as any good mom would do, I purchased the balloon to go with the cake. I thought: she is going to be so surprised! I gathered up the cake and grabbed the balloon tightly, but was still unprepared for the mighty wind that came rushing in as the grocery store doors opened. My shoulder bag was hanging on my left arm, but the wind was blowing so hard I couldn’t find my keys to unlock the car door. I had nowhere to set the cake, and I certainly couldn’t turn loose of the balloon. I kept wrestling with my purse and trying, at the same time, to hold on to the balloon and balance the cake without dropping it. I somehow managed to find the keys and unlock the car doors. Fighting the wind and holding onto my keys, purse and balloon, I placed the cake in the back seat, along with the balloon. By the time I settled myself in the front seat, I was out of breath from the ordeal. I just sat there in silence for a minute and thought how nice it would have been to have had the young man’s help; in fact, anyone’s help. I was exhausted. Isn’t that the way we are spiritually? We are loaded down with so many burdens that we feel like we are fighting a strong wind, yet we won’t allow anyone to help us. We may be floundering with doubt, feeling stagnant, or we could be struggling with personal matters of the heart, but we won’t turn to a fellow sister or brother in Christ for a helping hand. “Nope, I can do it all by myself, thank you.” We can’t hold on … but we won’t turn loose … and it can become spiritually exhausting. When we need help, we should turn to someone who is wise. Proverbs 20:18 says, “Plans are established by counsel; by wise guidance wage war” (ESV). As women in need of wise counsel, one of the best ways to find the help we need is by looking at what Paul tells Titus about the older women. Look for those who meet these criteria when you need help: “Older women … are to be reverent in behavior, not slanderers or slaves to much wine. They are to teach what is good, and so train the young women to love their husbands and children, to be self-controlled, pure, working at home, kind, and submissive to their own husbands, that the word of God may not be reviled” (Titus 2:3-5). These are the women who can give us wise counsel based upon experience and the Scriptures. When someone does come to us for help, we older women need to keep this advice in mind: “Brothers, if anyone is caught in any transgression, you who are spiritual should restore him in a spirit of gentleness. Keep watch on yourself, lest you too be tempted. Bear one another’s burdens, and so fulfill the law of Christ” (Galatians 6:1-2). As fellow Christians, we can all help each other with burdens; but we need to do it with an attitude of gentleness. Did you notice how Paul advised the one who is helping? You, who are spiritual, restore with a spirit (attitude) of gentleness. Maybe the reason he said this is because he knew firsthand the dangers of opening up and making one’s feelings known to another person. So many times we “won’t let go” or ask for someone’s help because we fear an attitude of judgment or condemnation. Maybe we’ve even experienced it in the past. That is why it is so important to seek the right counsel. When someone seeks your help to fight against the wind, remember that you fulfill the law of Christ by being trustworthy and kind. Debbie Dupuy lives in Florence, Ala., with her husband, Arvy. They worship with the Old Macedonia Church of Christ where he serves as the minister. 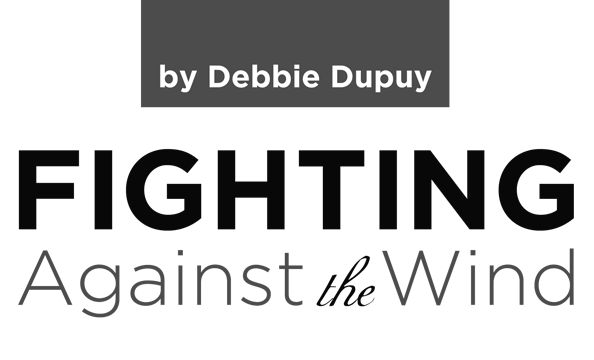 Debbie teaches classes for women and enjoys speaking at ladies days, retreats and lectureships. She has served on the Alabama State Textbook Review Committee and has been active for many years on issues that relate to faith and family.